ScrewFast’s GRIP® pile technology is a hybrid micropile, used to transfer load through soft soil into shallow rock, or very hard soil. A GRIP® pile consists of a shear tube made of steel CHS which encases the pile through the soil and a rock socket, which anchors the pile into the rock. The rock anchor comprises a central reinforcing rod encased in grout with a sacrificial drill bit at the toe. 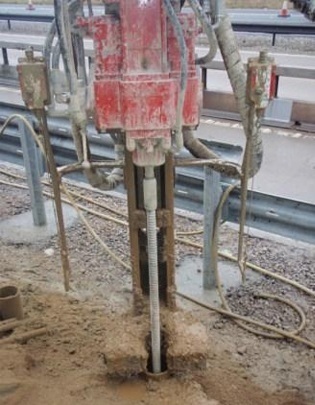 The shear tube is installed first – usually by vibrohammering – and increases the piles resistance to lateral loads. Where are GRIP® Piles Used? The versatility of GRIP® piles enables them to be used for a wide range of applications, where secure fixings are required in all types and consistencies of rock.